The Xbox 360 Hori Real Arcade Pro EX SE joystick is back in stock. A new production of the PS3 Hori Real Arcade Pro 3 SA (Sanwa) and the X360 Hori Real Arcade Pro EX SE (Seimetsu) has shipped and NCS expects to receive our allocation in a few days. Preorders are welcome. 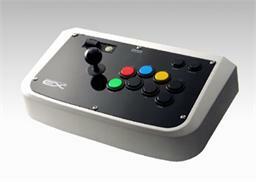 The Hori Real Arcade Pro EX SE are sold out. If we are able to restock, we will add this item back to our shop. The HRAP EX SE was shipped from Hori to our agents in Japan last night and they should receive them in the next day or two. If our agents get the joysticks on Monday as expected, our shipments will arrive in the USA on Wednesday and all preorders will ship upon arrival. We currently have a small surplus for new orders to ship next week. «©NCSX» Hori opened up preorders yesterday for the www.horistore.com exclusive RAP.EX SE which uses genuine Seimetsu buttons and a lollipop-style joystick. That means you won't have to mod a standard Hori RAP EX stick with coin-op quality parts to get that special tactile arcade feel. Besides, modding a joystick can potentially lead to fatigue, wayward solder, a broken joystick, and consequently a broken heart. Why risk tragedy? The upcoming Hori Real Arcade Pro EX SE is based on the same form-factor as earlier RAPs and sports a 3m (9.83') cord. Preorders are welcome to ship on or around Feb 5, 2009. Due to the heavy weight of the joystick, NCS recommends only shipping by UPS Ground within the United States. Pricing reflects yen conversion, our vendor's deputy surcharge, and overnight shipping from Japan to the USA. Please note the Hori RAP.EX SE will incur a dimensional weight of 18 lbs and NCS recommends only shipping by UPS Ground within the United States. Shipping by any air service will be an expensive endeavor. The updated release date for the Japanese Xbox release of Death Smiles was finalized last night (ships on April 23, 2009) and Amazon.jp started preorders for an Amazon-exclusive Death Smiles Real Arcade Pro Joystick. Hori recently started preorders on www.horistore.com for the Real Arcade Pro 3 Special Addition joystick which is designed for use with the Playstation 3. Hori's third (canonical, not chronological) Real Arcade Pro Joystick uses the same form-factor and case of the other Real Arcade Pro sticks.